On her Thursday CNN International show, host Christiane Amanpour relayed President Obama's call for a "global compact" to fight climate change and asked what could be done to "follow" Obama's plea. The White House must be pleased to have such faithful minions in the media. "You just heard what we played from President Obama, his speech in Berlin yesterday, talked about how we must make sure that we avert a final climate disaster," Amanpour told paleoclimatologist Richard Alley. "So how much, in your mind, is it due to us? And what can one do to follow what President Obama says, basically make it better?" 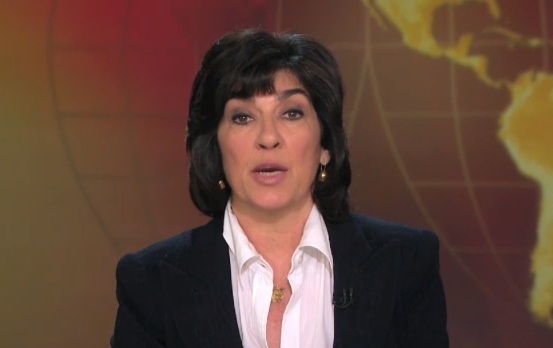 In rather biased fashion, Amanpour emphasized "man-made" environmental problems at the beginning of the segment. "We all know about the environmental crisis plaguing our planet. But this smoky crisis shows how often the problems facing us are indeed man-made," she said of forest fires in Indonesia. And she touted Obama's call to fight climate change. "Just yesterday President Obama used a major speech in Berlin to call on all nations to take bold action to slow down climate change." Amanpour has shown her trademark liberal arrogance before on this issue. During the GOP presidential campaign in 2011, she whacked candidate Jon Huntsman for daring to backtrack to the right on global warming. "It appears that you are reversing some of your own eminently sensible positions," she told Huntsman. "You’ve been tweeting about the sort of rightward swing, you’ve been jabbing at the base. And yet, in the last week, you sort of rolled that bit back on climate change. You sort of said that there isn’t enough science. I mean, what are you doing?" CHRISTIANE AMANPOUR: We all know about the environmental crisis plaguing our planet. But this smoky crisis shows how often the problems facing us are indeed man-made. Just yesterday President Obama used a major speech in Berlin to call on all nations to take bold action to slow down climate change. BARACK OBAMA, President of the United States: Peace with justice means refusing to condemn our children to a harsher, less hospitable planet. This is the future we must avert. This is the global threat of our time. And for the sake of future generations, our generation must move toward a global compact to confront a changing climate before it is too late. Professor RICHARD ALLEY, Nobel Prize-winning climatologist: It's a pleasure to be here. AMANPOUR: Thank you. I know that what happened in Singapore is man-made and it's come from a neighboring country. But tell me how these man-made climate disturbances are effective. ALLEY: Right. So it is very clear that climate change itself does not cause a lot of problems but it sometimes makes them worse. We've always had heat waves with a warming climate. We get bigger, longer ones. These particular fires in Singapore probably only have a little tiny bit to do with climate change. This is mostly people trying to get their land cleared so that they can grow their crops. But very clearly, climate change is contributing to fires in parts of the globe and the smoke from those fires does circle on to other countries. AMANPOUR: Well, exactly. So tell me, you're a paleoclimatologist. So that means you are into the history of our planet and the history of the climate. I was struck by an article that came out a few weeks ago, saying that a critical level has been passed. For the first time in history, the concentration of carbon dioxide has passed the milestone level, it says, of 400 parts. What will be the consequence of this? How bad is it? ALLEY: So the 400 is mostly a psychological line for us. But we have moved to a higher level now than human civilization has experienced before. What that does ultimately is turn up the thermostat on the planet. It is pushing us to a warmer level. And that has a number of consequences. There's easy ones to see. The average temperature of the globe is warmer. We have more heat waves, fewer cold snaps. We have more moisture in the air, so when it's right to rain, the rains tend to be more intense. And that favors flooding. But warmer temperatures can dry things out more rapidly and the circulations are changing in ways that are probably increasing droughts in some places. And we see that the snow and ice that care about temperature are showing melting in much of the world. Clearly -50 in the middle of East Antarctica has not warmed up the melting, but the seasonal snow in the spring, the mountain glaciers and others, we see melting. AMANPOUR: You did just talk about flooding a moment ago, and obviously we've seen a lot of flooding in Europe, Central Europe, Eastern Europe, it's been very, very bad. How much of that do you attribute to the issues with the climate? ALLEY: It's probably at least a little with a huge asterisk that this is ongoing. So science is working very, very hard to try to attribute events. What we know at this point is if you think about playing a game with dice, you always can come up double sixes. But if the dice are loaded, double sixes come up more likely. ALLEY: (Inaudible) playing the game with someone and they kept coming up with double sixes, and then you found that the dice were loaded, you would raise an eyebrow at least. ALLEY: We've loaded the dice in some directions and really the scientific front here in much of this has been how much is due to us, what is really controlling these very odd-looking events that seem to be becoming more common. AMANPOUR: Well, then, of course, that is the perennial question and there's still people who insist that man has very little to do with this. You just heard what we played from President Obama, his speech in Berlin yesterday, talked about how we must make sure that we avert a final climate disaster. So how much, in your mind, is it due to us? And what can one do to follow what President Obama says, basically make it better? ALLEY: Right, so the warming that we've been seeing is -- the best science says it's mostly due to us. Nature is actually the sun has dimmed just a little over the satellite era, the last 30 years or so. We have put up particles, including some from fires, that are blocking the sun, which tend to cool us. And we have cut dark forests and replaced them with more reflective grasslands that tend to cool us. And yet the temperature is going up. And so the influence of our greenhouse gases on the temperature, there's a fingerprint there which is very clear. And the scholarship shows with high confidence that most or all or even more than that of the warming is due to us. The floods, the record heat, probably you could see the human fingerprint on that. But there's more work to be done. But in general, what you're seeing is that we've seen enough change that it validates the fundamental science that we've known for a very long time. AMANPOUR: No, no, I fully understand what you're saying, and I want to ask you something. You said that in terms of it being visible, the rich are likely to see this and notice this less than the poor. What do you mean by that? ALLEY: In general, if you live in a cold place, and you have an air conditioner, you can work in the summer. You see fewer closures of your airport in the winter. And in the short term, you're not hurting very much. If you are a poor person living in a hot place and you don't have an air conditioner and you don't have winter, making your world warmer is not doing much good for you. The first degree of warming for much of the world's economy gives you winners and losers. The first degree of warming for many of the world's people is not helping anything. As the changes become bigger and bigger, then who is losing from the climate change spreads to encompass more and more of the world's population. AMANPOUR: And finally, you know, everybody's trying to game the system. How long do we have in order to turn this around and save our planet? How long do we have? ALLEY: I think the best analogy would be saving for retirement in that all delay is costly. If you don't start when you're 30, you're going to have a harder time saving. But whenever you do start, it helps you. And that's what the scholarship on climate change shows, is that all delay is costly, but we can help ourselves whenever we start. AMANPOUR: Professor Alley, that is a very clear way to put it, and I get it. And I appreciate your insights.